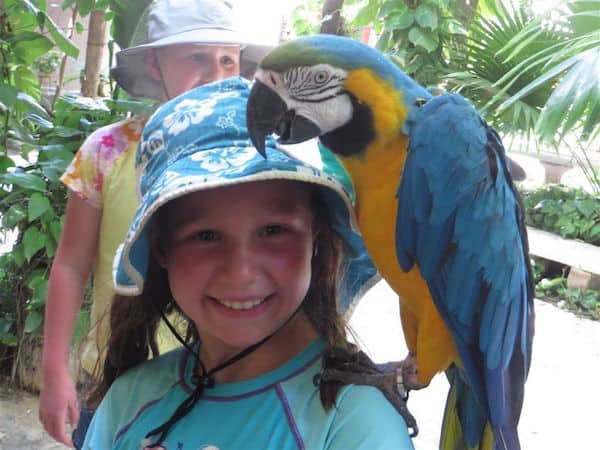 Guest contributors John and Sandra Nowlan visited the all-inclusive Dreams Riviera Cancun Resort & Spa in Cancun, Mexico—they describe their multigenerational visit through the eyes of their grandchildren. That was the comment from our 13-year-old grandson, Cameron, when he enjoyed a break from school at the family-friendly Dreams Riviera Cancun Resort & Spa on the Caribbean coast of Mexico. We were there for a week with our three adult children and five grandchildren, assigning the young ones the task of keeping a brief daily diary. They embraced the challenge with enthusiasm. The youngest grandchild, Abbie, age 6, liked “swimming at the beach and at the pool and in the hot tub”. She added, “I made new friends” and, at the Kids Club, “liked hand waxing.” She was referring to making sculptures of her hands in multi colored wax. Movies by the pool at night with popcorn and drinks was “a great service,” according to Kieran, but he did have a major evening complaint. “Having weddings and receptions late in the evening with loud people and music right outside sleeping quarters is bad design.” The resort had 470 weddings last year! Lots of noise at night. Dreams Riviera Cancun is a compact resort but management acknowledged that frequent weddings, receptions and booming music close to the accommodations late at night is a problem. They hope to solve it in the future with soundproof windows. AMResorts, the parent company of Dreams, now has 43 luxury properties in the Caribbean with 12 more in development. Before we joined our family at Dream Riviera Cancun, we spent two days at a new adults-only AMResort, Secrets Playa Mujeres, on a gorgeous, secluded beach just north of Cancun. Less than two years old, this sprawling resort has five acres of undisturbed tropical vegetation and is very eco-friendly throughout the complex. The large suites are even more comfortable and luxurious than those at Dreams (without the loud noise at night) with restaurants that are superb. There are more than 80 chefs on staff, all Mexican and all well trained in culinary school or on the job. We were very impressed. Next door to Secrets, Dreams has a new, equally eco-friendly resort under construction. In 2017 it will become the flagship in the family resort chain. Even a water park is part of the plan. We told our grandchildren about the new Dreams Playa Mujeres and they got very excited. Pencils and diaries are at the ready for their next Mexico visit. Aww what a nice post and beautiful pictures! I like this hotel, I have sent clients down here before and they loved it. This summed it up nicely.